In young children, vision problems can often be hard to detect. What may seem to be a behavioral problem or learning disability can actually be a problem with the child’s eyesight. Such is the case with Malaki Ulmer, whose teacher had commented to his mother that he might possibly have ADD. However, when Malaki’s vision was screened at his school, he was found to have indications of hyperopia (farsightedness). This came as a surprise to Malaki’s mother, who had never suspected any sort of vision problem in her son. She took him immediately to see an eye doctor. Malaki’s eye doctor confirmed the results and glasses were prescribed. He was surprised that Malaki had not complained of any vision problems because his hyperopia was so severe. The doctor was glad that Malaki’s mother brought him in when she did, so that the problem could begin to be corrected. He has been doing very well in his glasses, and can tell a definite difference in his vision with and without them. 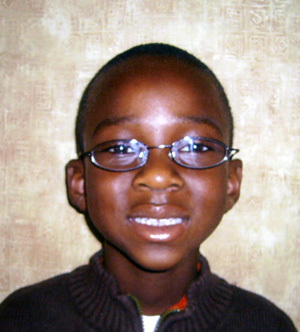 Since he has been wearing his glasses, Malaki has done much better in school. His grades have improved greatly, and his teacher has since dismissed the thought that Malaki might suffer from ADD. She commented to his mother that any problems that Malaki had before were almost certainly due to the fact that he could not see well. He loves to read, and has been reading more and more thanks to his new glasses. When he isn’t reading, Malaki enjoys playing football. He’s a “tough-guy” linebacker who isn’t afraid to tackle anyone who gets in his way!